If you have finally decided to sell your old or run-down vehicle, it can be pretty difficult, particularly if you want to get the best possible money for it. This is no less true, if you have an old or scrap Toyota car, van, Ute, truck, SUV and 4WD. This is because no buyer would think of spending a significant amount on a vehicle that is unusable or need constant repairs to work properly. But when your old or scrap vehicle starts causing unnecessary clutter in your garage or driveway, you have no better option than getting it off your property ASAP. 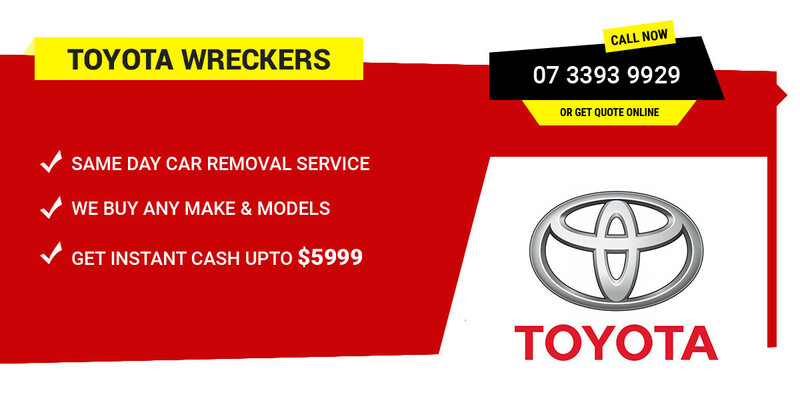 Contact your local Toyota Wreckers Brisbane crew immediately and get this done. Well! Our crew members make sure to buy it off you for the top cash in Brisbane. Being one of the top old and scrap car wreckers in Brisbane, we are committed to offer a really fast, smooth and fuss-free removal services throughout Southern, Northern, Eastern and Western Brisbane. Read more about us and feel free to get in touch for more details. Therefore, we are there to help you out with FREE pick up services, whether you live anywhere in Rocklea, Toowoomba, Townsville, Gold Coast, Ipswich, Warwick, Caboolture, Logan, Sunshine Coast, Brendale and Rockhampton. We are a reputable and trusted scrap car wreckers in Brisbane. Thus, we guarantee to pay competitive prices for all makes and model of Toyota in the Brisbane auto wrecking industry. Plus! There is no deduction of any additional costs or hidden fees at the time of removal. As we take pride in offering the most convenient and rewarding way of getting rid of unwanted vehicles to the residents of Queensland. Even if you have any doubts that you won’t be able to get much money due to the poor condition of your automobile, you can’t go wrong in selling it to us. We will pay you the highest pay-out around $100-$10’000 after assessing the extent of disrepair in your used ride. Our team is passionate about buying a wide variety of Toyota vehicles including Prius, Yaris, T100, Supra, Previa, Camry, Corolla, Land Cruiser, Venza, Matrix, Sienna, Celice, Rav4, MR2 Spyder, FJ Cruiser, Echo, Paseo, Sequoia, FJ Cruiser, Toyota Hilux and many more. When an automobile turns into an old pile of scrap. There is nothing you can do about it other than wasting and cluttering up a useful space on your property. As a result, it is just about the right time to contact the experienced QLD Wreckers squad and put your old or damaged wheels into good use. We have been the part of the booming auto wrecking industry for over 20 years. So we have garnered great experience in this business. Apart from helping you to get rid of your undesirable ride we make sure to convert it into a lucrative deal after recycling. Our team of experts wrecks unwanted vehicle into pieces and sort out the parts and items. That can be used up again. Those parts are recycled and then used in different types of working automobiles. While the non-useful or toxic elements are discarded according to the eco-friendly methods. We understand that it can be a lot difficult to remove and get rid used, scrap or junk automobiles, especially if they don’t run any longer. This is why, the pros here at QLD Wreckers offer smooth and fuss-free removals for both working and non-working vehicles. It doesn’t matter where you reside in Brisbane or its immediate regions. We are willing to provide you 100% FREE Toyota removal service. We have been doing this for more than 20 years now. So you don’t need to fret about meeting the safety standards as well. Our efficient towers take care that no damage is caused to your ride while attaching it to the towing equipment and even during the transportation. In addition, you can rest assured to get eco-friendly removals as we only use best quality resources and equipment’s. We also promise that you won’t be charged some extra bucks or hidden costs for the pickup of your automobile. No matter what is the condition of your Toyota car, van, Ute, SUV, 4WD, wagon, sedan, or truck. We are keen to take it off your place in no time. This is because it is very disappointing when we see deteriorating, smashed and broken wheels parked around in some backyard, driveway or garage. So, whether your old wheels have been badly wrecked in an accident, aging due to excessive use, need constant and expensive repairs or damaged in some other misfortune like fire, flood or hailstorm. Don’t think that it is just a waste piece of trash. As your trash can still be a treasure of valuable parts for us. Since we buy all types of undesirable automobiles are recyclable and worthy of being used and sold again. Who refuse the cheap and the best deals on spare parts comes with limited warranty? Get the top deals on used Toyota auto spare parts & accessories while dealing with Qldwreckers. Here at QLD Wreckers, we provide cash for car services that involve less worries and stress. Along with this, you can also make a handsome amount of cash out of selling your scrap automobile to us. Our passionate and helpful customer care executives ensure to keep the whole process simple for you. They ensure to offer ecologically safe car removal and wrecking services without any fuss. If you have to make any effort that is speaking to our representatives and leave the complete details about your automobile to us. This will include its mileage, make, model, brand, VIN and a clear description of its condition. Check out all the vehicle registration information on Qld Govt. website. Once you get the cash quote and finalize it. Your junk automobile will be our responsibility and you don’t have to worry about the relevant documentation either. Beside this, our veteran technicians have years of knowledge in Toyota dismantling, disposal and recycling services. They will easily find out the parts which can be salvaged, recycled and resold. For this reason we are able to offer top cash for Toyota automobiles of all sizes. We know that it could be very frustrating to get good money deals for damaged automobiles. But our skilled assessors provide highly accurate cash quotes within just a few minutes when you call us. So don’t delay in contacting us, when you realize that it’s time to sell your old or junk Toyota automobile. Our friendly and dependable crew will resolve all your cash for car needs. Call us now at: 0416 615 100, or complete our online quotation form to request a non-obligation quote from us today.